Lately our training has involved a lot of steady swimming and working on pacing. It can be dull and I try to mix longer blocks with shorter sprints and relays. Good pacing is key though – Take a look at these 50m splits over 1500m at some recent races. 8mins and swim as many 50s as possible resting 10secs. 4mins as many 25s <rest 5> record how many, aim to be similar numbers! 8mins and swim as many 50s as possible resting 10secs. Record how many, aim for similar numbers! The OYO ‘on your own’ session has been delivered weekly now for many years helping many reach swim goals when they cannot get to a club/team or other coached session. It comprises a 3 distance mainset <Sprint, Mid and Long distance> session emailed with some technical pointers. The 3 PDFs cover 25m, 33m and 50m pool lengths. Temporarily not on the website but still available if you call the office and we can sign you up. 020 7247 2998, please email dan@swimfortri.com if you would like to try this weeks. Cost is £40 for the year, less then a penny per metre of swimming excellence! After the session I had some enquiries along the lines of, “why haven’t I improved?” and “how do I get faster?’ My response was, are you sure you aren’t faster? “Well I am still in lane one and have not moved up.” This was an interesting observation that got me thinking. The athlete is still in lane one, and they were still swimming with the same swimmers, but as a coach I had been pleased with the progress of the group. Slowly the group had improved to the extent where all were under 25 strokes per 25m and the overall volume was up from an average of 2k to 2.6k in an hour. The timed swims we had been doing throughout the year were greatly improved. And technique was looking solid. I was happy but the swimmer was not so convinced. I had been keeping records and charting improvements. I assumed the triathletes were keeping check too. Apparently not. A necessary part of recording and checking your progress is to test yourself on a regular basis with benchmark sets. Tests could include timed swims, measuring stroke counts, taking golf scores, working out your critical swim speed or performing a step test. Parameters should be kept identical down to the smallest detail. 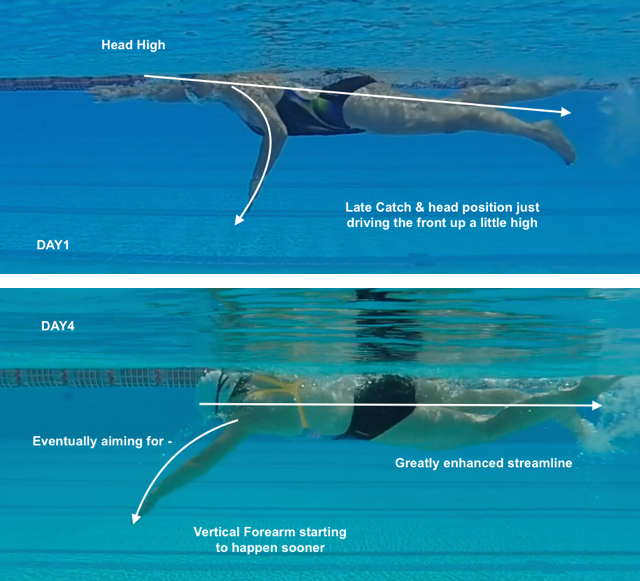 Perform the test at the same time of day, same length pool and have a similar warm-up before the set. (See below for more tests and full descriptions). Testing on a fairly regular basis should be a key part of your training. Many triathletes know their VO2 max, most would know their resting HR and average speeds for their 10mile bike TT or a 5K run. However, we should also be familiar with our best efforts in the pool. For most of the triathletes I work with I like to blend a mix of fitness tests and technique tests, all of which are recorded. Measuring these improvements allows us to rebalance the levels of drills and fitness sessions in an overall training plan. When technique measurements are improving then we are maybe able to relax some of the pure drills sets and add another fitness session. If the fitness benchmarks are not improving then I might suggest relaxing off the fitness sets and adding some more drills sets. If you feel you have not been improving then recording and keeping a set of meaningful data is essential. And your comparisons need to be against yourself – not just comparing against others which does not provide a real constant. The general speed in your triathlon or masters session may have moved on massively and to still be ‘stuck’ in lane one is not a failing on your part. The notes and recordings I had taken at the mentioned session over the last three years show that the average overall speed has improved significantly. The group swim speed average is much quicker due to the influx of some former swimmers, some better training methods, more pool time and hopefully better coaching! Recording your own set of tests, taking your own measurements and charting them monthly or per training cycle needs to be done otherwise you will have no idea of how you are training. It is only this kind of strict and accurate measuring that can really gauge whether or not you are improving. Comparing one open-water swim to another or even the same course from year to year is of very little use other then to be a rough guide. Currents, weather and variations to the actual course layout will have the distance change significantly and the potential time taken to vary massively. If after charting your progress for several months and you note you really are not improving then questions can be asked. When I thought about my group I noted that I was pleased with the overall technique. Most swimmers looked really good. There were a few limiters, such as kicking from the knees and some straight arm pulls. But, if you can honestly say that you feel your technique is holding together then maybe it is time to check how hard are you working. If you can ‘hang on’ to an even stroke count throughout a 400m swim then that is a great step forwards. The next step is to have the control and enough feel for the water to swim the same number of strokes per length regardless of speed. A decent male adult competitive swimmer in a 25m pool will swim 13-15 strokes per length regardless of their speed. They will still swim the same distance per stroke. 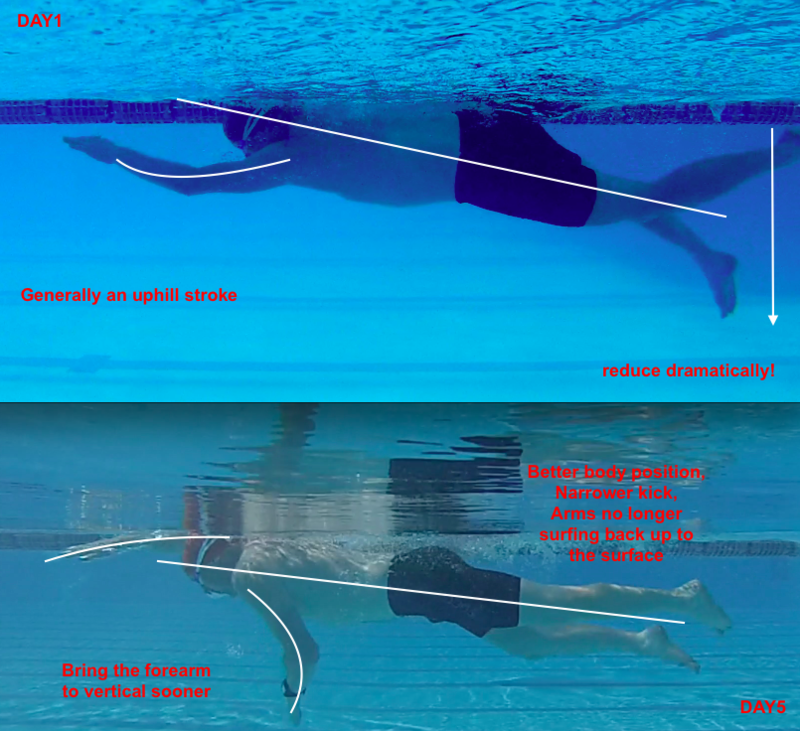 Inefficiency will allow the stroke count to increase, not more speed. A higher stroke count will rarely equate to more speed, only more tiredness. 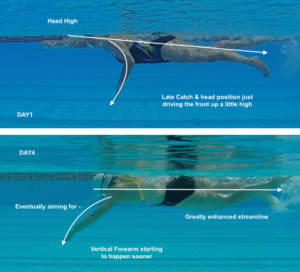 Good technique gets you so far and needs to be good before moving onto more serious fitness swim sessions. There comes a time though when you need to work hard as well. Not to the extent your technique falls apart but you should be getting out fairly shattered after the appropriate sets swum at the appropriate intensity. 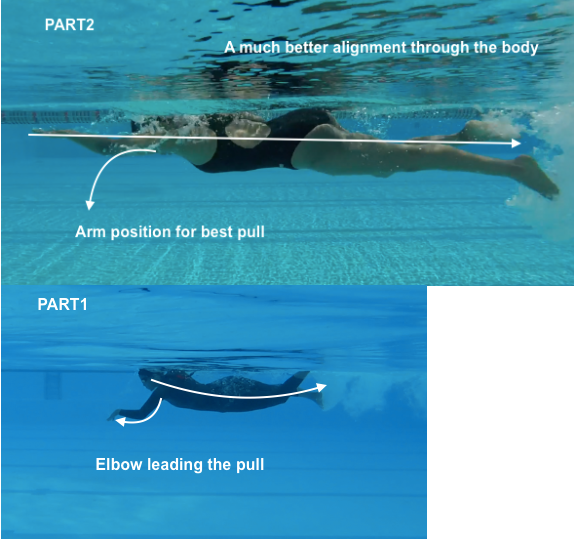 Move up a lane within your club session and hang onto the faster swimmers. Your coach can give guidance on this but you need to make the effort. Be realistic of course. Try to lead a few sets in your regular lane – with no draft this will be a harder swim for you. Add paddles to your swims to help build resistance. Pull buoy does not replicate putting on a wetsuit and you should not train with this in mind. Your balance and rotation will be altered when pulling. A wetsuit will not stop a bad leg kick creating drag, you just will not have to work so hard to keep a bad leg kick afloat! “Have I been getting to the pool 2-3 times each week?” An extra session would work wonders in helping to retain the feel of the water. “Have I been supplementing my swim training with some dryland movements to stop my kick originating in the knees?” There are some great Pilates movements that will help stop a poor legkick. Don Schollander won the first> This used to be a team that just did not lose! Michael Phelps expressions says it all as this then kept him on track for his treasure chest of Golds. A loss here on only his second event would have left a very different Olympic Legacy. Imagine being handed a deficit of a body length going in to a race of approx only 46secs in length expecting to make up the body length on the world record holder? Swim Drills, why? how? what! I watched a swimmer in the public lanes this morning swinging his arms as he exited the water at the back of the stroke & throw them across his body. Really throw them across his lower back, he was practically grabbing his own opposite buttock and crabbing down the pool from side to side. I believe it was a swim drill but he could have just been having some fun. 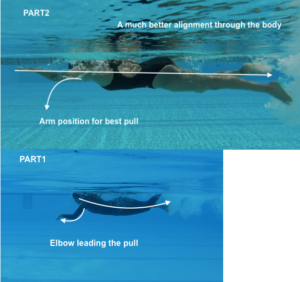 To me a swim drill either enhances an accurate movement, isolates it so it can be performed more accurately or restricts and stops a bad movement from occurring. Even better if it can restrict bad and show the correct movement. As the season draws to an end <congrats if you raced IM Florida> and we turn to ‘winter training,’ here are a few things to keep in mind to check or contemplate before fitness training kicks in fully. These are a few things I have noticed as swimmers are now returning to fitness training post OW season. Head position – possibly a little too high now after a summer of sighting in openwater. Lazy legs carried by a wetsuit all summer. We do not look to the legs for propulsion but for balance and traction. The better your kick the better the whole body contributes for less effort rather then it being a pulling event. Stroke rate up a little high due to a lot of sea swimming? hard to focus on accurate tech if this is the case. Perfect it at slower speeds and then we can always speed it up when ready. Is this the winter your pull buoy becomes a useful part of your fitness training and not your swim technique. Will your legs stop sinking you this time around?! Wetsuit! Could you happily cope with a non wetsuit event next year if it happened and it did a few times this year? Body MOT – Get your injuries checked. 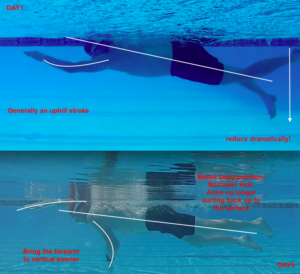 Can you improve your range of motion and flexibility to improve your swim tech and reduce incidence of injuries?